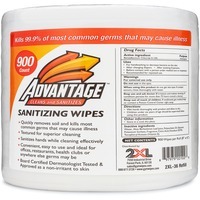 Nonalcohol based, sanitizing saturated wipes are designed specifically to clean dirt, sweat and body oils from all surfaces of health club equipment. They are also 99.9 percent effective on 13 common pathogens and neutralize odors that tend to build up on soft surfaces. One step wipes require no bottles, sprays or packets. One product cleans all washable surfaces. Large, thick wipes come on a roll.